Stunning gown with delicate white lace overlay. Includes beaded detailing in front under bust and gorgeous gathered fabric throughout lower gown. Make a statement walking down the aisle with a tasteful and dramatic mid-length train with tulle peeking out from the bottom. 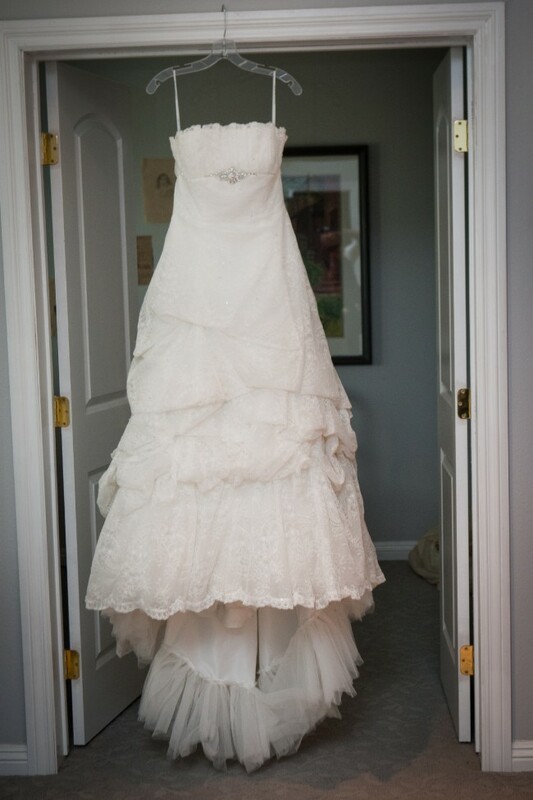 A French bustle has been added to create a beautiful and effortless full gown for dancing at the reception. This dress is in excellent condition; has only been worn once (and kicked off a marriage that is still going strong, so good vibes included!) and has been professionally dry-cleaned and well stored.